(Foxboro MA) It seemed as if the teams spent more time in the end zones celebrating than they did on the rest of the field! 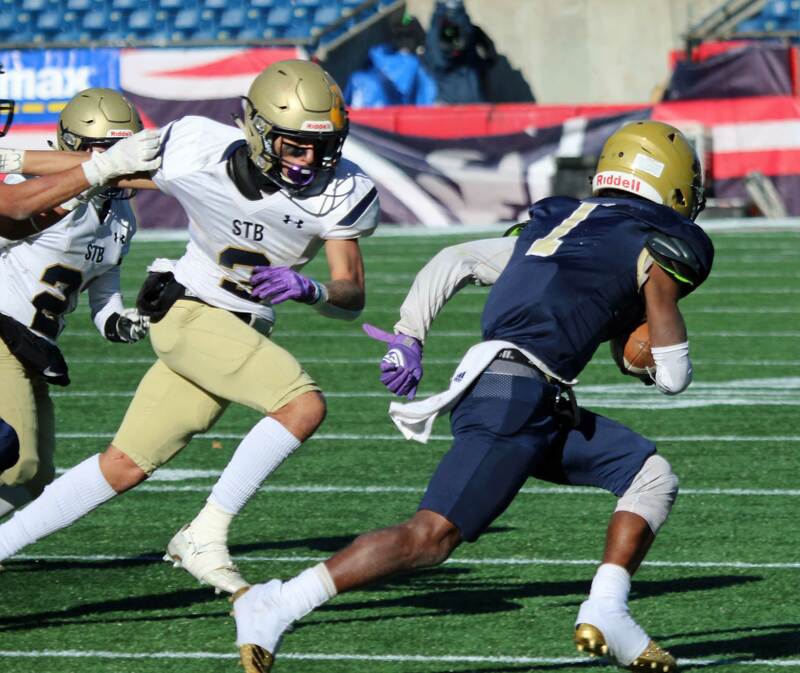 St. Bernard’s defeated Pope John XXIII, 46-35, in an offensive show that would require a book to describe all the details. 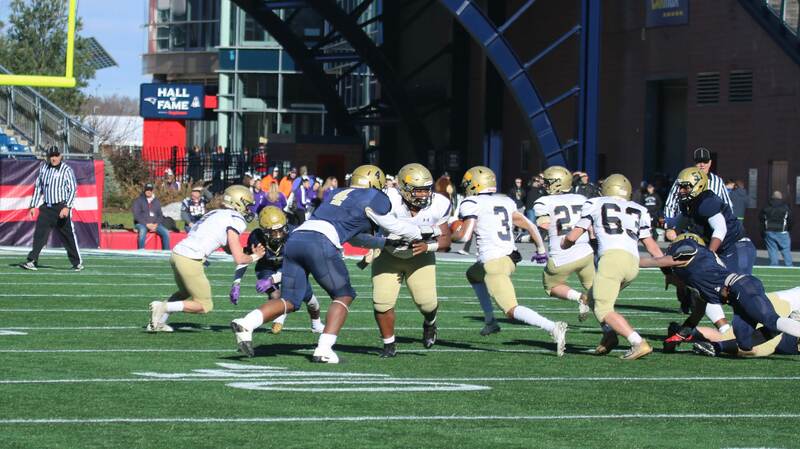 The game to decide the Division 8 title started at 9AM at Gillette Stadium on Saturday. Beautiful weather (sunny/40’s) and the performances of the Bernardians (12-1) and the Tigers (12-1) made this a game to remember. 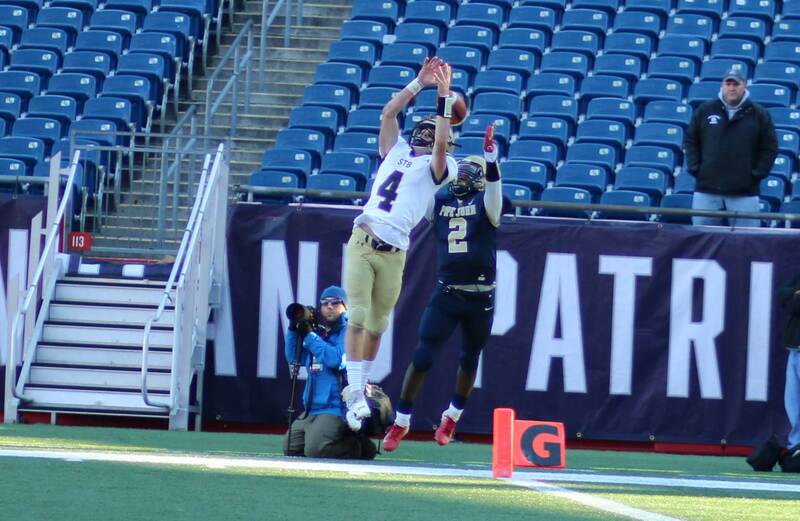 St. Bernard’s lost in the D6 Super Bowl in 2015 to Mashpee. They had a Super Bowl win in 1997 when current head coach Tom Bingham was a line coach for the team. Points were scored by both teams in every quarter. 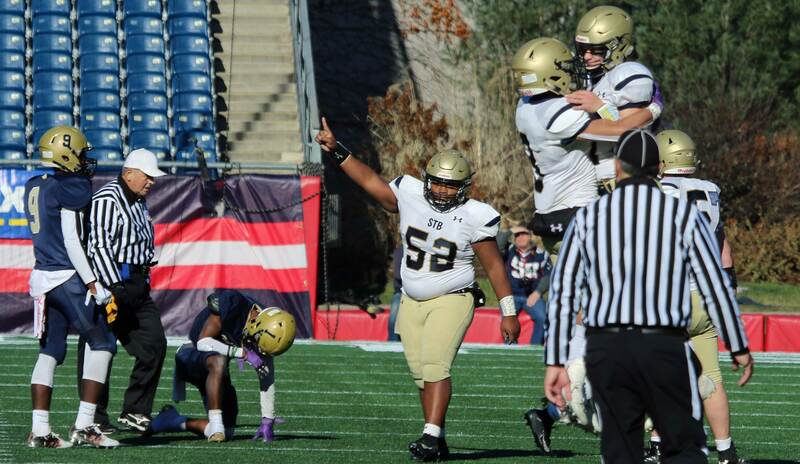 In the final quarter thirty-seven points were scored, which set a new state championship/Super Bowl record (thirty points) previously done in 1982. Even more remarkable was that those 37 points in the final period all came in just a 4 ½ minute stretch of that ten-minute final period. 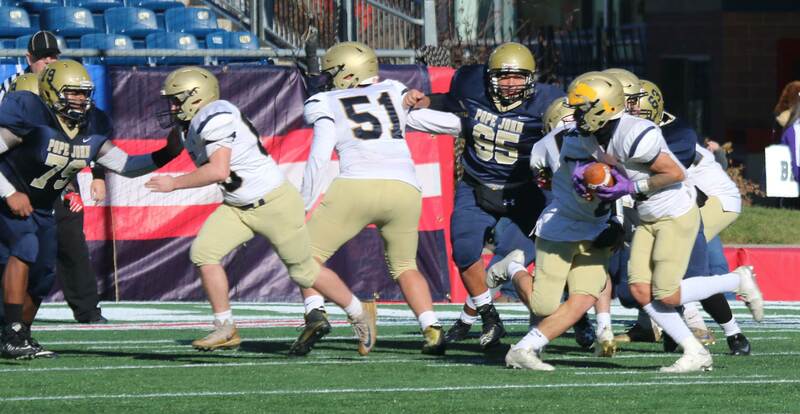 The Bernardians took the lead, 8-6, late in the first quarter (Xavier Marty 9-yard run) and pushed it to 16-6 on QB Domenic Cuevas’ two-yard run in the second quarter. Then the scoring fun began. 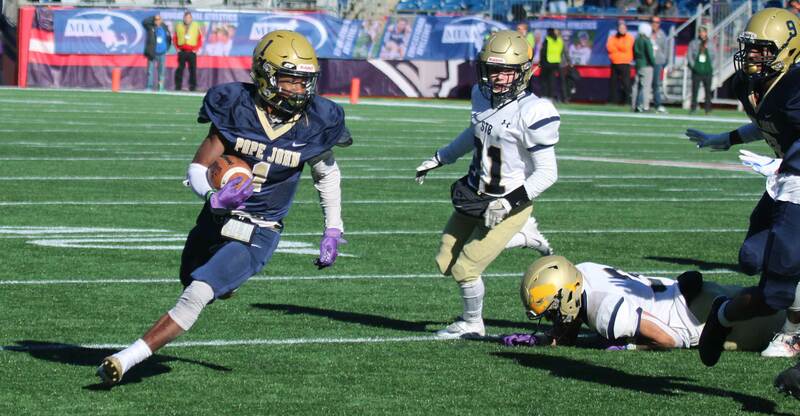 The rest of the way, beginning with Pope John, one team would score a touchdown and the other team would respond with one of their own. Once that pattern kicked in you had to think that the team with the last possession would win the title. You also looked for one of the teams to not allow the other to answer with a touchdown. But there were no big stops and for those at Gillette hoping to see yards covered and points produced the game was a delight. The teams combined for seventeen plays that covered more than ten yards. The Tigers first three touchdowns (John Smith-Howell, Roshad John, Jesus Rivera) were on passes by quarterback Anthony Mejia. 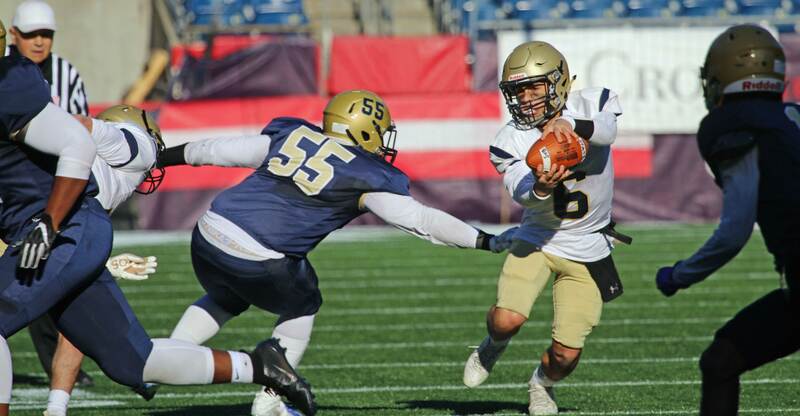 STB quarterback Domenic Cuevas had just one touchdown pass (Walter Morales) and it opened the scoring in the second half. The Bernardians did most of their damage on the ground. They had great success running misdirection plays. 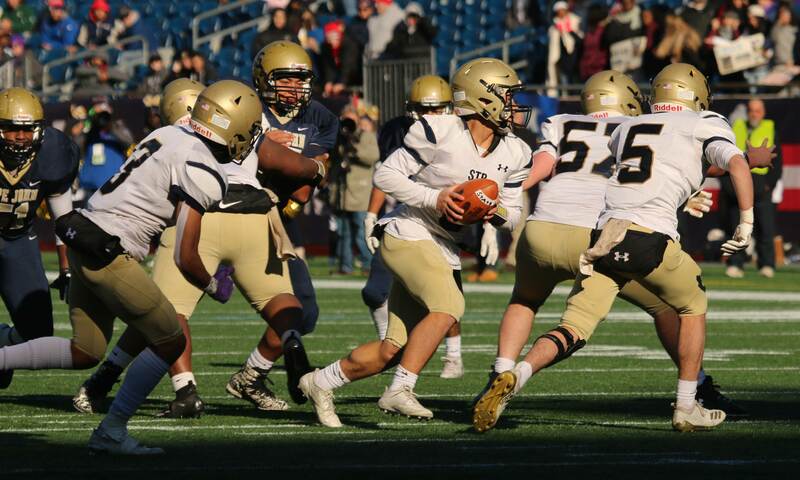 QB Domenic Cuevas would start one way, or a back would start one way, but the actual ball carrier would be going the opposite way (usually left). There was good blocking, but it was the scheme of offense that put the STB backs into good spaces frequently. So both teams had weapons and they weren’t shy about using them. 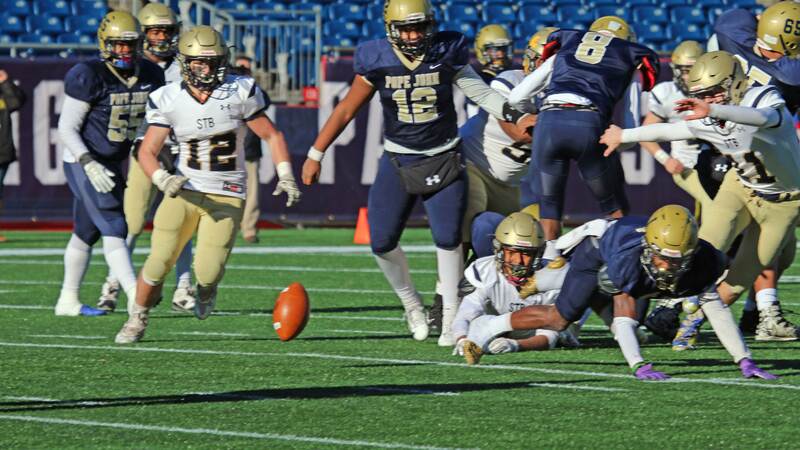 I thought that Pope John was done for early in the last quarter when quarterback Anthony Mejia went down (and out of the game) in the first minute and never returned. Even though everyone paying attention knew that John Smith-Howell would be taking the direct snap and trying to run to daylight, he did both anyhow. 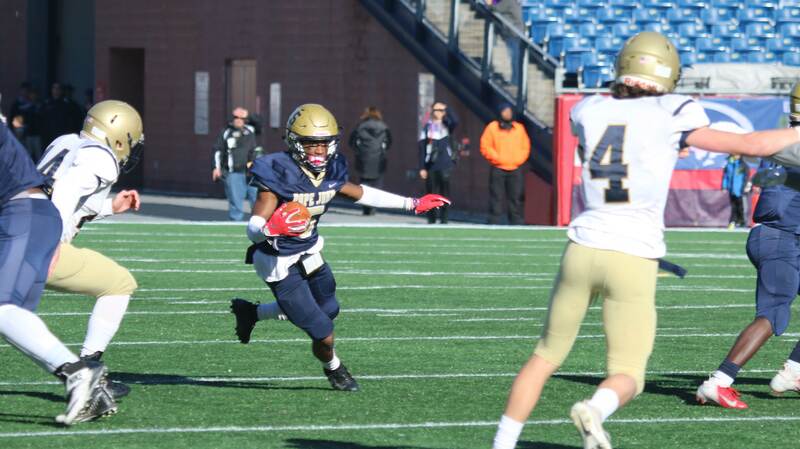 During the season the speedy sophomore had fifteen touchdowns and gained 1216 yards. He was fast and elusive and scored twice to keep the pressure on St. Bernard’s. JSH’s first touchdown out of the Wildcat cut the Tiger’s deficit to, 32-28, with six minutes left. But St. Bernard’s put long runs together and moved ahead by ten (38-28) with 5:23 remaining. Credit Pope John. 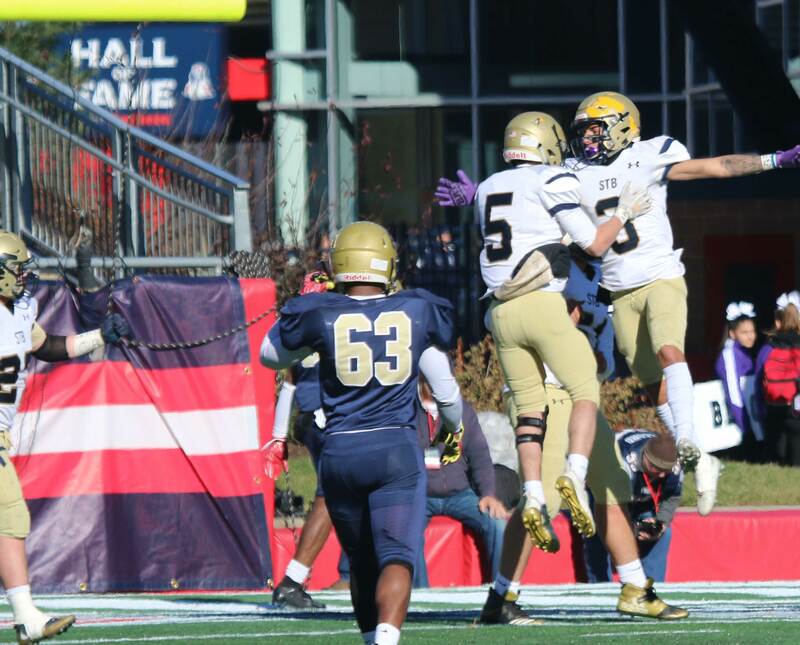 Back they came with John Smith-Howell’s 2nd touchdown (2-yard run) of the last quarter and now it was, 38-35, with 2:23 to go for the title. 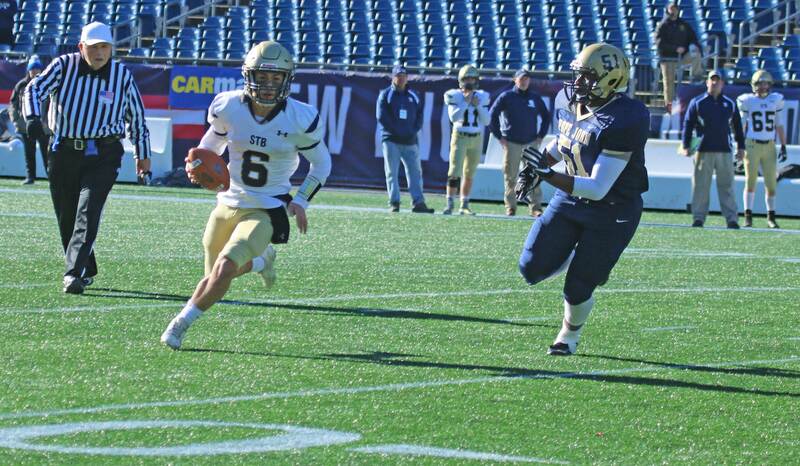 Bernardians quarterback Domenic Cuevas headed right and handed to Walter Morales going left. 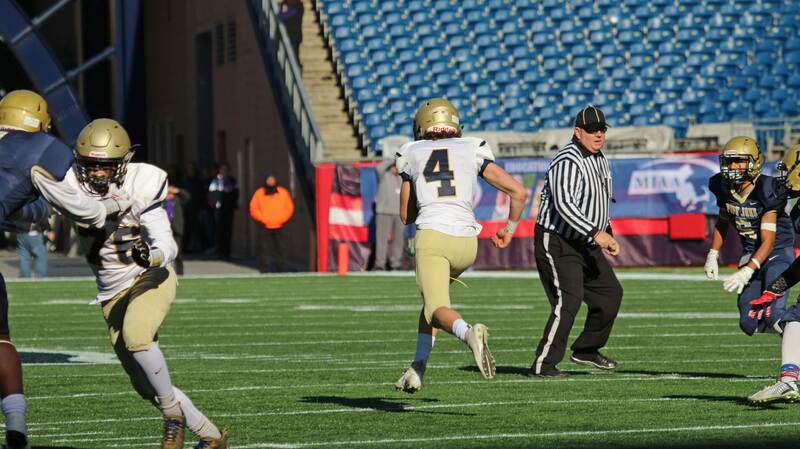 Thirty-five yards later STB had a 46-35 lead with 1:57 remaining. 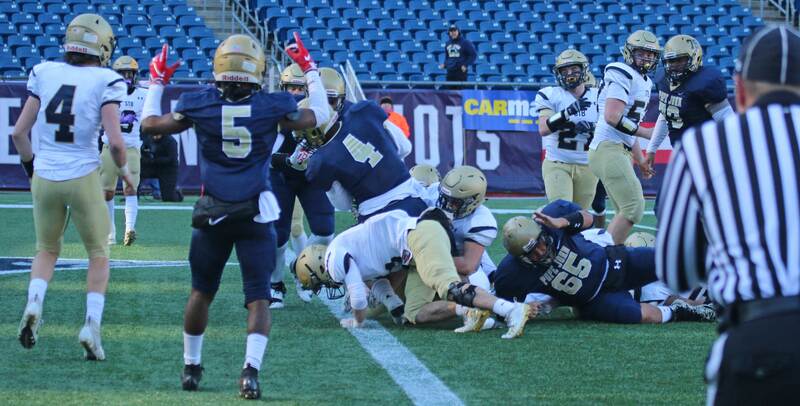 St. Bernard’s was able to put an end to the scoring see-saw with some solid defense including a sack by Ben Shaw and the win was secured. Coach Sobolewski credited the blocking of Brian Baez, Stephen Gaskill, Jose Davila, and Ajan Nelson as keys to the team’s long gains. The Super Bowl is not only a great experience for teams and their fans but also for those of us who cover these events. 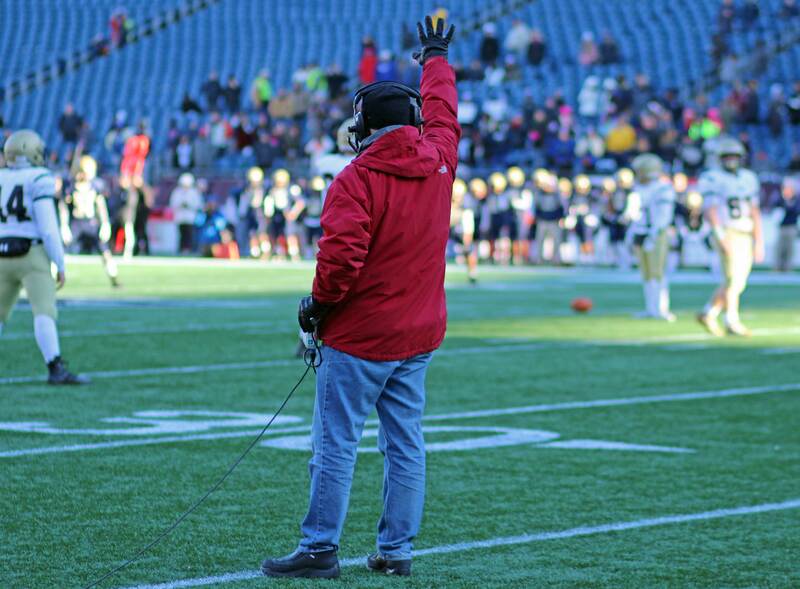 Special thanks to Coach Paul Sobolewski for contacting me today to give me his take on the game. I had another commitment right after the late-ending game and couldn’t interview anyone.